3. The National Flag, when carried in parade, is never dipped. Care must be taken that the National Flag does not touch the ground as this is would dishonour the flag and all it represents. In a parade when more than one flag is carried the National Flag is carried in the centre or on the LEFT as spectators would view it. 4. The National Flag is flown at half staff only when so directed by the Governor General through the Cabinet Office..
5. When two flags are flown, the National Flag is flown on the LEFT flag pole facing the viewer. 6. When two flags are flown together the National Flag is hoisted first and taken down last. The National Flag is the symbol of sovereignty and thus it must be hoisted before all other flags and taken down only after all other flags are taken down. 7. 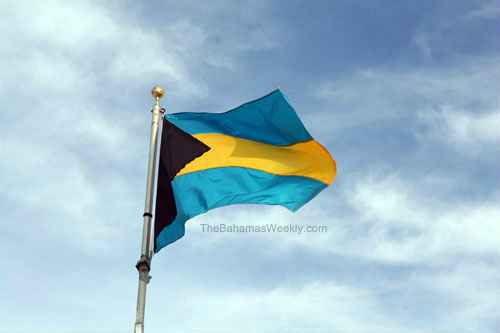 No foreign or commonwealth flag can be flown in The Bahamas unless the National Flag of The Bahamas is also flown in an equal or superior manner. This regulation does not include foreign embassies, Commonwealth high commissions or consulates. 8. The National Flag of The Bahamas is not flown at sea, but more properly, the Bahamas Red Ensign is flown in its place and from the stern of the vessel or other place of honour. The Defence Force and unarmed government vessels fly the ensign proper to them. The National Flag of The Bahamas is flown as a jack at the bow on Bahamas' Defence Force vessels only when not the vessel is not underway.